Every now and then elected officials, either in a moment of weakness or inadvertent honesty, will speak truthfully about problems they helped create. During the Wednesday, April 29, 2018 meeting of the Elk Grove, California City Council one of those moments occurred. 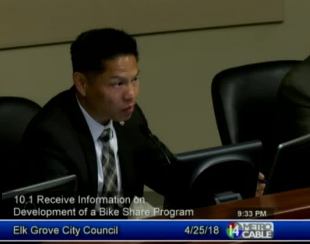 The admission came from Vice Mayor Darren Suen during city council deliberations on an exploration of establishing the increasingly popular bicycle sharing services in the city. While the city council decided against pursuing such a venture at this point, it was not for lack of enthusiasm from Suen who asked for the topic to be placed on the agenda. In his discussion, Suen noted that increased bicycle usage could help alleviate growing traffic congestion in the city. Specifically, Suen pointed to traffic along Elk Grove Boulevard acknowledging it will only get worse (watch the video below). Anyone who has transversed The Boulevard, especially bicyclist, using slang that council members like to use, know how dangerous it can be, particularly at two chokepoints - The Boulevard and Highway 99 and at Bruceville Road, the site of the future Costco. In fact, it was the expected worsening traffic from the new Costco cited by Suen as a reason to pursue the bicycle sharing services. Suen's statements, while quite honest, are not without irony. First, it should be noted that much of the traffic along that stretch of The Boulevard was put in motion long before Suen, Mayor Steve Ly, and council members Stephanie Nguyen were in office. It happened over 10 years ago when the Laguna Ridge plan was finalized that the commercial center on the southeast corner of Bruceville and the Boulevard was approved. In that regard, most of the city council cannot be taken to task too much for the decisions of their predecessors and City Council Member Pat Hume who voted to approve the development as a member of the city's planning commission. They all can, however, be held accountable for their more recent decision to support the Costco store in an already heavily congested traffic area. The real insult, not only to nearby residents who are upset at the prospect of the traffic-inducing Costco in the middle of a residential area but to every taxpayer in Elk Grove is that the developer. Louie Pappas was given millions of dollars in incentives. It is no coincidence that this is same Louie Pappas who has given tens of thousands of dollars to this current slate of council members as well as those who preceded them. It was commendable of Suen to look at alternative transportation options for solutions to our growing traffic problems. However, this type of service in a suburban community like Elk Grove is not the best use of resources. It should be noted that as traffic problems continue growing on The Boulevard with each passing day, Suen and his council colleagues are doggedly pursuing funding for the Kammerer Road extension. We might suggest they refocus their efforts on pursuing the long-delayed and unfunded interchange at Whitelock Parkway and Highway 99. Though politically sensitive given the implications for the Elk Grove Regional Park, properly planned and executed that project could help solve traffic jams along The Boulevard. Instead, the city council has decided to pursue Kammerer Road extensions that do nothing for residents and only benefit the deep-pocketed developers who fund their campaigns. To paraphrase Walter Cronkite, That's the way it is in The Grove! Elk Grove City Council member Pat Hume is on the record preaching to his constituents many times over, regarding the SOI, that we must decide where we want to be in 25, 50, 100 years from now and then plan for it. Using that philosophy, as reported in the article above, was this Hume’s vision for the city of Elk Grove, as an original member of the Elk Grove Planning Commission since incorporation in 2000, and then jumping directly to the Elk Grove City Council in 2006, taking over from day one on the dais as a council member? Did Hume look at Laguna Ridge, aka Madeira, 18 years ago, with approval after approval under his belt at both the planning commission and council level, and was this his dream for Elk Grove Blvd. and that area of the city? Some might say, like the congestion on Elk Grove Blvd., both the traffic and Hume deserve a Grade D or maybe even an F.
Now it is left up to the residents who vote to mitigate both! EGN needs to back off! I for one, plan to bicycle to Costco and will build a little bike trailer to haul my toilet paper and twin-pack of muffins in. To help ease my travels, I will munch on a little pizza slice and wave as I pass the motorists up! Thanks Darren Suen for pointing out the obvious.